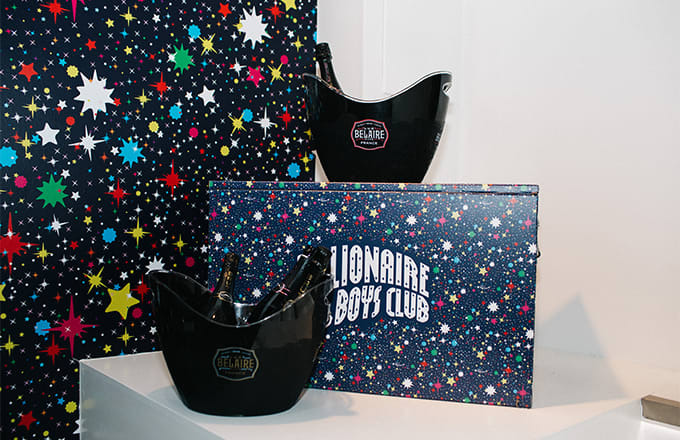 The Billionaire Boys Club store in London recently celebrated their one-year anniversary and to mark the occasion, they held an in-store reception, followed by an afterparty in East London. The in-store event, which took place in Soho, was a genuinely warm affair made all-the-more sweeter with cupcakes, Guinness Hops House 13 beer and Luc Belaire Sparkling wine. There couldn't be a better combination, really. This was followed by their afterparty at East London hotspot, Visions Video Bar. The night was packed with stellar sets and performances from the likes of Jetsss, Martelo, Sweyn Jupiter, Rell Knoxx, Pro Era's Kirk Knight, Faze Miyake and the face of BBC's LDN Hoodie lookbook, Novelist. Check the gallery below for a look what went down at the in-store reception and afterparty.